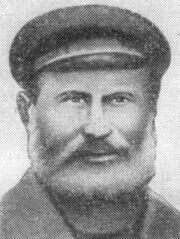 On this date in 1942, German troops in Russia’s Pskov Oblast summarily executed 83-year-old peasant Matvey Kuzmin for leading them into an ambush. World War II’s real-life Ivan Susanin was conscripted as a guide for the occupying Wehrmacht intending to approach a Soviet position at the village of Makino. Kuzmin cunningly sent his son ahead to Malkino to alert his countrymen of the attack while guiding the Germans circuitously. By the time Kuzmin et al reached the outskirts, a Soviet ambush was waiting for them. 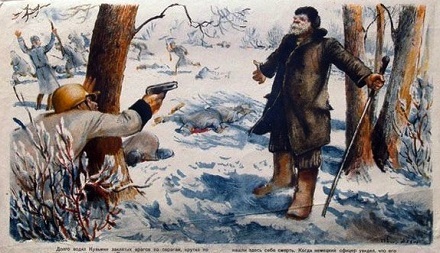 An enraged German officer shot Kuzmin during the ensuing firefight. Since Kuzmin’s feat of resistance was not at all anonymous, he was transmuted into a parable of national heroism almost immediately. Kuzmin was posthumously honored as a Hero of the Soviet Union; the Moscow visitor to this day can behold his statuary’s valorous stance at the Partizanskaya metro station, opposite the martyred guerrilla Zoya Kosmodemyanskaya.